Mini LED par light built in with 6 RGB LED beads with intelligent voice control, the color will change with music. Great for club, DJ show, home party, ballroom, bands, show bar etc. 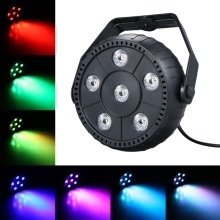 6 bright LED create pure RGB and mixing color, bright and powerful. Pretty colors and combinations, provide different effect lighting. Intelligent voice control, the color will change with music. Sturdy ABS material surface, long service time, safe and reliable. Low power consumption, energy saving and environmental friendly. Mini size and light weight for convenient carrying. Perfect for all kinds of stage, party, wedding, bar and KTV lighting. Do not use it frequently under the humid atmosphere. Please do not look at the light directly, in case it might damage the eyes.